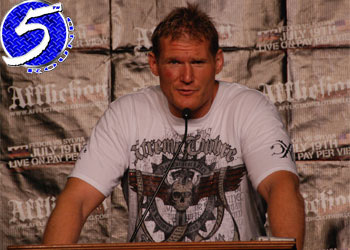 Newly-inked Strikeforce heavyweight Josh Barnett has been a free agent since single-handedly taking down Affliction Entertainment back in July 2009. While much of his freelance status had to do with trying to secure the appropriate deal, the risk of bringing on the talented – yet controversial – fighter played a factor as well. Thankfully, the San Jose, California based promotion rolled the dice on bringing Barnett back to the States because he never even talked to Octagon brass. Even if he and UFC president Dana White managed to mend fences, Barnett believes his new place of business houses more established 265-pounders regardless. While Strikeforce may not possess the glitz and glamor that Octagon shows offer, the 32-year-old would be willing to compare resumes at anytime. When asked what his hit list looked like, or who he would prefer to make his Strikeforce debut against, the 13-year veteran remained coy on the subject. Champion Alistair Overeem, former/current top heavyweight Fedor Emelianenko, upset specialist Fabricio Werdum and Antonio Silva – just to name a few.